Stop by and see what they have to offer. You just might discover a great potential of your own. If Franz Kafka and Virgina Woolf ever had a secret, illegitimate Love-child… THIS would be the story of that child. Poetic. Inspirational. Poignant. Beautiful images. And after several weeks of compiling and editing and searching for the “right” images… and trying to keep “life in general” moving along… this is complete and getting ready to be presented to the market. So if you’re looking for something to browse through on these cold nights, or a little something to give to somebody who enjoys a cushy recliner, a hot toddy and a large hand-made afghan… and a quite something to read… keep a watch because it’ll be out there with-in the next day or two! It was another labour of love… and I hope you’ll all give yourselves the pleasure of reading it. Thanks all! Now it’s on to the next work… already in progress. If salary stopped, an illness devoured savings, or even Mother Nature ripped through the house, are there those who actually will come to provide support or any assistance at all? And if the only resources are strangers, paid to provide the essentials and no more, do any of us know what to expect? There are stories, rumours, told and un-told of existence in a Homeless shelter. There are Homeless who refuse to go, and others who truly have no choice but to go to a shelter. And there are stories about shelters… but THIS is the story FROM a sheleter. When one pay-cheque failed to come, and then a second, there was no-where to turn and no one to turn to. The anxiety of knowing what was to come, leaving home to go… Where? From sleeping on a sheet on a sand dune on the shore of the Atlantic ocean, through the nights on trash bags opened and laid on the ground beneath a tree, behind the poison ivy, hidden away. One star in an indigo sky, shining through the leaves forecast the night’s weather. Then a lung infection and a trip to hospital where kind hearts cared… until the truth was known: Homless. Simply discharged to a NYC Homeless shelter, getting back to work, Zucotti Park NYC “Occupy Wall Street”, through lead poisoning, an earthquake and “re-assignment” to another shelter in a hurricane, and all the while, so-called friends who knew, and no family to turn to. This book takes the reader through the actual experiences up to the day of walking out the door of the shelter, boarding a plane and leaving it all behind… physically but never emotionally. Dear Heart! I just read the 1st line and it hurt, Good Job!! Am nearing first 100 pages. Been reading off and on throughout day. Nice journal. The beginning was hard on me, knowing what had befallen you and what you were heading into, but it lightened up in its own way if that makes any sense. You have been through a lot and I admire you for your perseverance, stamina and accomplishments. I have always helped with charities, etc. And now with having a Grandson, I want to teach him starting young how to help out when needed. Hey all of my reading friends out there. This is a MUST read. 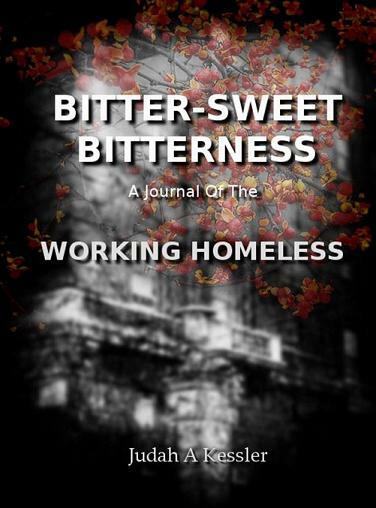 It is written by a friend in NY about his life of living in a homeless shelter while holding down a job. While, I know that I LOTS of times looked at homeless people as either lazy, druggies, etc., this book shows how one change in life can cause you to end up there. I am happy to say that he is out of the shelter but will never forget what it was like and is still like for people he got to bond with while there. More a “Journal” or diary than a story book really. Here is an actual account of my own days and nights in a New York City shelter for the Homeless. The vocabulary may be raw and offencive at times, but that’s what life in a Homeless Shelter actually is, at times. The language is candid, published as it was written, and written as the emotions happened. This isn’t a story about being in a shelter, this is an account of being in a shelter. It’s 16 months total (with only one month missing and that’s because I’d written notes in several small noted-books, one with extra pages glued into it), those notes were then transcribed onto a “thumb/flash” drive. As Fate would have it, one day, in my general delirium, I rushed out of one of NYC’s larger libraries and left the thumb-drive behind! But, the rest is all there, all accounted for… edited… not censored. It took 16 months to document, almost 5 years to edit and publish. But it was a promise to those with whom I shared those 16 months in the Shelter and now, it is available. This is not “my” story… it is the story, the truth, the facts, the account of just about every Homeless person. It’s not romantic. It’s not poetic. And it most certainly is not apologetic. But what it is is essential information for anybody who has a heart, anybody who has a home, anybody who has a family and anybody who considers anybody other than themselves to be… a “friend“. It is, in the author’s opinion and the opinions of the majority of my fellow “residents” at the Shelter, material that should be read and understood by any and all “Social Workers” who have any contacts or dealings with the Homeless any-where and every-where. It was not published to entertain, rather, it was published to educate and hopefully, to create compassion for the Homeless, because compassion is sorely lacking. This author is profound,raw and unique. Read this book! I have been awarded the privilege of being able to have read excerpts before publishing and strongly urge all that value humanity and kindness to read this! This writer gives the reader a first hand account of being one of many Working Homeless. It is unforgiving, disturbing at times, but REAL and inspiring. Anyone that cares about humanity must read and share this with others. Perhaps it will help people understand the real world of being homeless. It CAN happen to anyone.